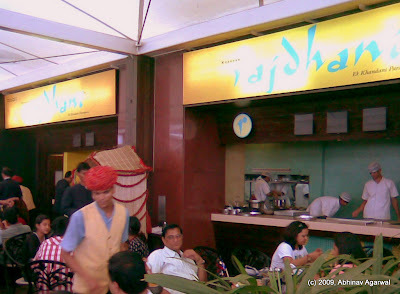 Photos from the Rajdhani restaurant at the UB City Mall in Bangalore (my earlier post on the UB City Mall). 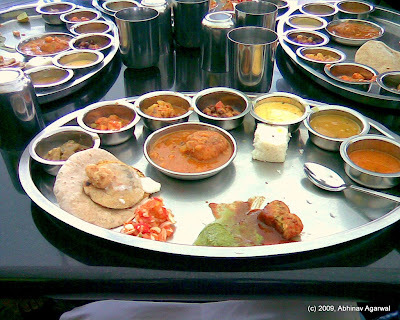 Weekday rates for a lunch buffet, and a buffet is all you get there, and a buffet is more than you can eat, are Rs 225 per person, inclusive of all taxes. Weekend rates are higher. Weekend wait times are also longer. If you get there around 1pm or so, expect to wait an hour or longer. After 2pm or so they even stop accepting people since the restaurant itself closes at 3pm or 3:30 pm. 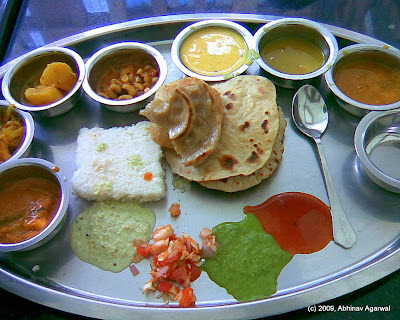 The food is a mix of mostly Rajasthani and some Gujarati cuisine, and can be a bit spicy. The kadhi is delicious, as are almost all other items. 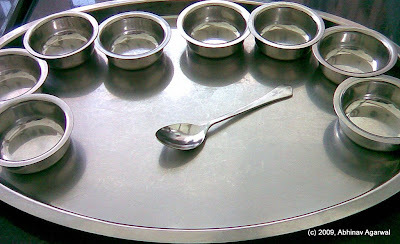 The toughest part is after they lay out the plate, with all the bowls, and before they start to serve all the food. 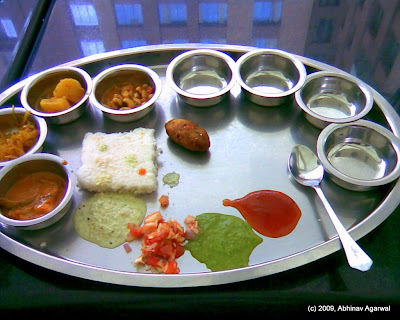 The plate fills up quite quickly, and gets emptied with almost equal speed. The other challenge of course was in waiting till the plate had filled so I could take the photos.